Our Granja La Paz team believes that the cost of transportation is an important issue. That is why we have made an effort to provide our customers with the best service. 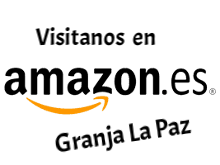 Granja La Paz ships to worldwide within 24-48 business hours. The terms will start counting once the order has been confirmed by the Accounting Department, in the corresponding account. Our head office is in Ibiza (Spain), and therefore can be delivered personally at home at the time and day desired to order telephone order to the number (+34) 612402121, with a minimum purchase from € 25. The products are shipped inside a double channel box, suitable for transport. Shipments of perishable products, such as frozen foods, will have a higher cost due to the protective box. Despite the rapid updating of the website, it is possible that a particular product may not be available. In this case we will contact you to decide an alternative product or simply reduce the order. Note: shipping costs can be changed without prior notice.